We have just returned from our second scheduled fit at Bliss Blakeney on the North Norfolk coast. 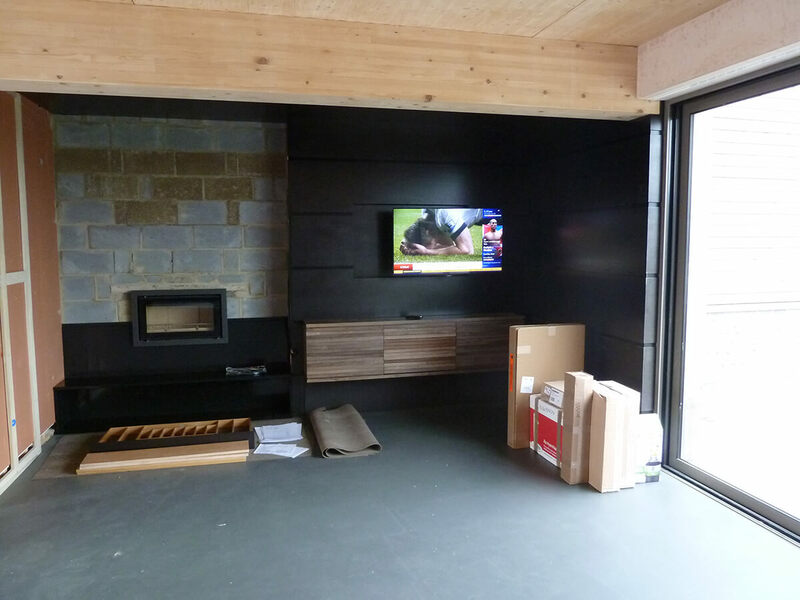 This time we were concerntrating on the main living space which includes the kitchen and TV/snug areas. For this fit we had lots to do so brought our full team. We have taken on a another maker (confusingly another Mike) who just happens to be the son of our upholsterer. We were staying in the Bliss Cabin again which is a real comfy home from home with plenty of space and luxury to chill out after a long day. The other advantage is it’s a very short walk to work. It’s so much nicer than staying in a B&B where you can’t really relax in the same way. Despite the luxury, the convenience, the good local pubs when you can’t be bothered to cook, fitting is nevertheless very hard work. By the end of the week we are all knackered and aching in places that have never ached before. Effectively we divided up into two teams one concentrating on the kitchen island, the other working on the TV/snug area. The kitchen island went together really quickly, by lunchtime on the first day the basic structure was assembled and in position so we got our real sense of the scale of this piece. At 4m by 1.4m it’s easily the largest single island we have made. While it certainly is big in the context of the space it’s perfectly proportioned and really does form the centrepiece and focus of this key space. In many ways the island is the kitchen – all four faces have a purpose – some more practical, some more sociable. Fit 3 at the end of May will see us build the back wall units which contain the ovens, more storage, the surrounds for the fridges and a lit copper inset work surface, but the priority this time was to get a functional kitchen in as the clients are already living in the house. The one piece stainless steel worktop hit problems at the fabricators so did not turn up at all this week. The island should have been completely finished but in the end we had to rig up a temporary plywood surface until it arrives – hopefully next week. 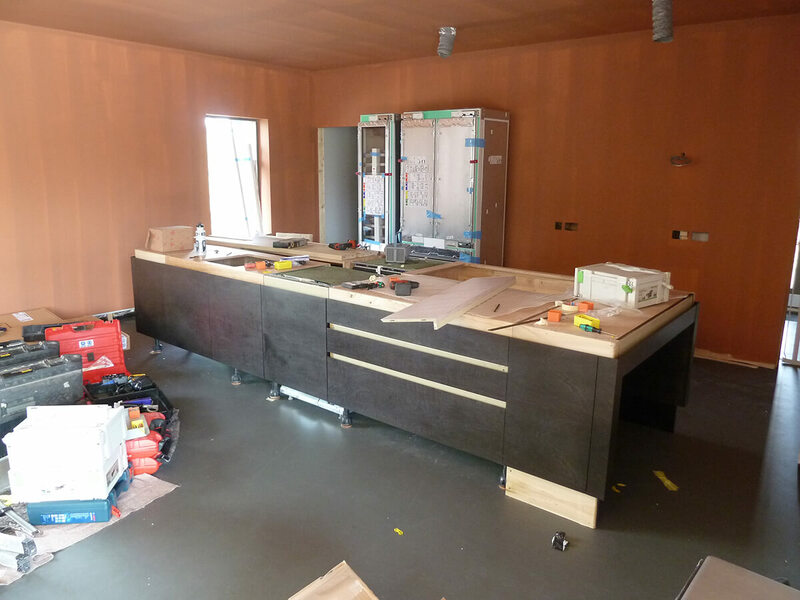 The copper sheet that forms the plinths and the under-surface detail also came late due to issues with suppliers so when we left at the end of the week we hadn’t seen it with the protective film taken off except on one corner of a drawer detail. 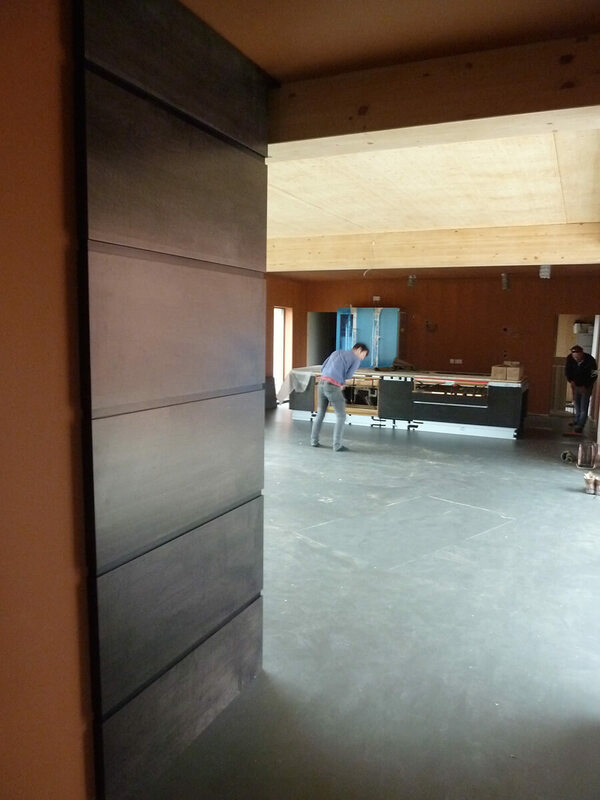 It looked incredible against the the dark grey ripple sycamore panels. That combination of copper, charcoal figured sycamore and the stainless is certainly going to create one of our most dramatic kitchens ever. Very different to our contemporary but curvy, woody and mostly walnut kitchens. Don’t get me wrong, we love doing those, but this is a refreshing change of direction and palette towards something modern and very cool. The first stage of the project was stairs walls and library area where the predominant material was the pink figured sycamore (click here to see Bliss Blakeney Stage 1 fit blog story.) In the snug and kitchen it is a similar dark charcoal grey version of that material that links these two areas together. The snug is very much about that dark grey sycamore – creating a rich enveloping space that quite literally ‘wraps’ around you – on the walls and the ceiling, incorporating the TV wall. There is also a built-in cassette type fire which is surrounded by slate in a similar dark grey. The slate and the sycamore have a repeating horizontal shadow line every 450mm which creates a really striking ‘wrap’ detail. The only contrast to the dark grey of the sycamore and slate is the floating sideboard piece that houses all the AV equipment. This is in solid grey fumed oak and is a key material that repeats all over the house. The stone fitters were unable to complete their installation and as a result we couldn’t finish the panelling on either side of it. Same is true of the island and the stainless top. In fact we got to the point where we ended up not being able to finish either part of this stage of the project so ended up leaving a bit early on the Thursday evening instead of Friday. We’ll be back at Bliss at the end of May to finish both the island and snug and build that back kitchen wall.